The Ibizan Hound, also called Podenco Ibicenco, is an agile, deer-like hound of the sighthound family. There are three hair types of the breed: smooth, long, and wire, of which the most common is the smooth-haired. Long-haired Ibizans are considered rare. The Ibizan Hound has no black on its body; they are either red or white or a combination of red and white. Its nose is flesh coloured, as is its ears. Its eyes are a striking amber colour. The Ibizan may range in height from 24 to 29 inches and weigh from 45 to 60 pounds. The breed has a pronounced sensitivity to cold, their hair providing little in the way of insulation. For many years, this breed was considered one of the oldest dog breeds. 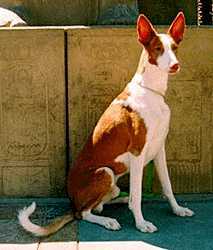 It was believed the Ibizan Hound originated in ancient Egypt, as pictures that appear to be of Ibizan hounds have been seen on the walls of ancient pyramids. However, according to Dr. Elaine Ostrander, a geneticist at the Fred Hutchinson Cancer Research Centre and University of Washington, recent DNA analysis reveals that this breed is actually a recent construction, bred to resemble an older form. In a study directed by Dr. Ostrander, with the aid of her colleague, Dr. Leonid Kruglyak, "they have found genetic variations that allow them to distinguish among 85 dog breeds and to identify an individual dog's breed with 99 percent accuracy," according to Mark Derr, a science writer for the New York Times. "We can assign a dog to a breed, but we can't tell what behaviour it will have," asserts Ostrander. "There is huge variation in behaviour between dogs within breeds." The results of the study, published in May 2004 in Science magazine, may help in the study of disease, both canine and human, because certain breeds are prone to some of the same genetic diseases as humans. Wherever it may have actually originated, the breed were used to hunt rabbits and other small game in Ibiza. The Ibizan Hound is a fast dog that can hunt on all types of terrain, working by sight, sound, and scent. Spanish hunters run these dogs in mostly female packs, with perhaps a male or two, as the female is the better hunter. This breed is similar to the Pharaoh Hound, but the Ibizan Hound is larger and can have a multicoloured hair pattern.